Last week, we looked at some ways we can easily allow our children to disobey. This sparked some good questions, which will be addressed in next week’s post. Before we talk about teaching obedience, it’s important to consider why obedience is so important. Here, as in many aspects of Christian parenting, we should look to the example of our Heavenly Father. Why does God ask us to obey Him? How can we imitate Him as we disciple the children He has put in our care? God has many good reasons for requiring our obedience, some of which we may not even know or understand. But one thing is clear: when God requires our obedience, it is always for our good. Our Heavenly Father asks us to obey Him because He loves us and wants what is best for us. 1. The instruction to honor and obey parents is the Bible’s clearest and most-repeated command to children. The Fifth Commandment (Ex. 20:12) instructs children to honor their parents, a command that is repeated several times throughout the Bible and applied to the children of the New Testament church in Ephesians 6:1. This commandment was accompanied by God’s clear promise to bless children who obey. Jesus set a perfect example by obeying both God the Father and His earthly parents, Joseph and Mary (Luke 2:51, John 14:31, 15:10, 17:4, Phil 2:8). 2. Teaching our children to obey lays the groundwork for the Gospel. We all come out of the womb self-centered and with hearts pre-programmed to sin. (Rom. 5:12, Jer. 17:9, Psa. 51:5) Until our children learn to see their sinfulness—their desire to set their own agenda instead of submitting to God or His appointed authorities—they won’t begin to understand or value what Jesus has done to save them from that sin. As we point our children to God’s standard of obedience, we’re breaking up the soil and preparing their hearts to receive the gospel. We could say requiring obedience is “Lesson One” of Christian discipleship. As early as possible in their upbringing, we need to emphasize to our children their inability to please God apart from putting their trust in Jesus. From their earliest years, we can pray with them that Jesus will give them new hearts that want to obey Him, and thank Him for the love and forgiveness He offers every time we fall short. 3. Teaching our children to obey us prepares them to obey God. Our child’s conception of God as his Heavenly Father will be formed largely by the example we set as a parent. As our child learns to trust and obey us, he is learning to trust and obey God, his heavenly Father (Heb. 12:9). If we allow him to form habits of disobedience and disrespect towards us, he will have to struggle to overcome those habits (or he may just persist in them) as he grows to adulthood and develops his own personal relationship with God. 4. Teaching our children to obey gives them the skill of self-control. 5. Teaching our children to obey prepares them for life in the real world. A child who learns to obey is ready for other assignments, such as chores and homework. A man or woman who knows how to honor and submit to authority is prepared to take on increasing responsibility and render useful service to others in the world. Only a person who has learned to deny himself and his own desires is able to truly love others. 6. Teaching our children to obey promotes their safety. Andy Lopez, a 13-year-old boy in California, was killed when he pointed a real-looking toy assault rifle at a police officer who had repeatedly ordered him to put the gun down. Men in the Bible like Amnon, Absalom, Hophni, and Phinehas all met their end because they weren’t taught to obey or to say “no” to their own desires. These are extreme examples, but they show how obedience can literally make the difference between a long life and a short one. The principle also applies to everyday dangers like busy streets, hot stoves, and sharp knives. 7. Teaching our children to obey allows us to fulfill our responsibilities to them. We spend much of our time as parents teaching our children, caring for their needs, and providing a home environment that promotes their health and growth. For us to fulfill these responsibilities, it’s important that our children learn to respect us and follow our instructions. If we allow our children to decide if, how, and when they will obey us, we’re effectively putting them in the driver’s seat, which makes our job harder and their lives more stressful. “Obey your leaders and submit to them, for they are keeping watch over your souls, as those who will have to give an account. Let them do this with joy and not with groaning, for that would be of no advantage to you” (Heb. 13:17 ESV). 8. Teaching our children to obey gives them a sense of security. Often when my children misbehave, they’re testing to find out where the real boundaries are. They want to know “is Dad serious, or can I get away with just a little bit more?” They’ll push until they find the limit. If we’re inconsistent in our standards, it frustrates them as they have to keep testing to find out where the real boundaries lie. But if we set clear limits and enforce them, it allows our children to relax and live happily in the boundaries we’ve established for them. We serve a loving God who has built many blessings into the discipline of obedience. God’s blessings are experienced as we obey, not just as rewards He hands out because we obeyed. By God’s design, obedience is often its own reward. God wants us to obey Him because He loves us and knows what is best for us, and we can have the same attitude towards our children. It is loving, it is showing grace, it is seeking their good, to train our children to obey. This realization has changed how my wife and I interact with our children. We found we were doing things that undermined our own authority and made it harder for our children to obey. In next week’s post, we’ll look at some practical things to consider as we teach our children to obey. Making the transition from training a 3 year old to come when called, and cheerfully do what I ask, to becoming a Mama of older children is difficult. I find that sometimes I am asking for the unquestioning obedience of a 3 year old– to my 14 year old. 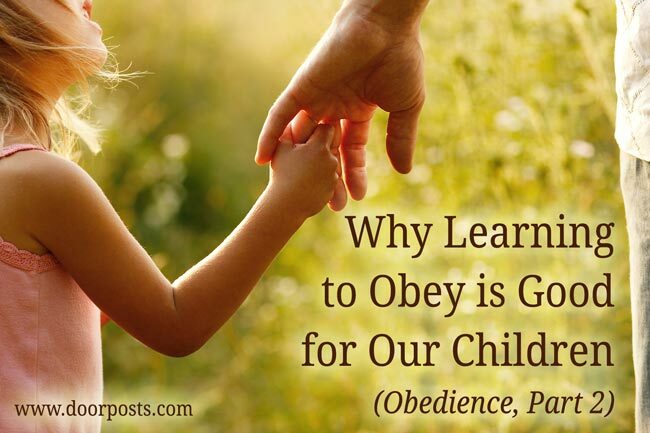 We can use the word obey and obedience without teaching our children what that really means. It is so much more than getting our children to behave a certain way. Perhaps you could define what you mean by obedience, and how you continue to teach that concept to growing children, so that they may convert their hearts to wanting to obey out of love for Christ, and have a clear picture of what obedience comprises. Hi Kathleen, the next post will go into more detail about teaching obedience and what that looks like. My children are young, and what I am learning suggests that obedience is very important to teach during these early years, but as our children grow we should give them more and more opportunities to make their own decisions, make respectful appeals when they disagree with us, and take responsibility for their own lives. And you’re right — obedience is more than just outward behavior. We are dealing with their hearts, and our training needs to take that into consideration. You have good questions and I think some of them will be answered better in next week’s post. Thank you for this post. I do fail miserably in this area, especially with my youngest-11 year old. I am now encouraged to try harder with God’s help. Thank you so much for this post! My heart hurts when Christian parents do not teach their children that the Lord requires obedience. He is a loving, gracious and merciful Father, yet there will be consequences when we do not obey! Please continue to share these truths, as you are encouraging us in good works!